Members of Parliament have called on government to set up a commission of enquiry to investigate allegations of high level corruption while Augustine Frederic Kodock was heading the former Ministry of Agriculture and Rural Development, MINADER. The MPs made the demand on June 25 at the Yaounde Hotel des Deputes during an evening party organised by the NGO, Citizens Association for the Defence of Collective Interest, ACDIC. ACDIC President Bernard Njonga said the occasion was in line with the outfit's current onslaught to reverse Cameroon's lack of food sovereignty.Njonga effectively tickled the bile of the MPs when he presented the results of investigations as to how funds were managed at MINADER in 2004. The presentations spoke volumes of acts of corruption that diverted over half of the Ministry's budget for that year into private pockets. The audit made it clear that even funds accruing from the Heavily Indebted Poor Countries Initiative, HIPIC-I were embezzled by officials in that Ministry through fake and inflated bills, payment of fake mission allowances and contracts. The report enumerated 30 different thieving strategies, which the officials used to line their pockets at the expense of agricultural development.Given that Hon. Kodock who is currently the Minister of Economic Planning, Programming and Regional Development, many MPs could be heard murmuring his name and nodding in disapproval after listening to the report. It was in this spirit that Hon. Lucas Tasi Ntang, MP for Santa, Hon. P. Riratou, MP for Noun constituency, Hon. Ndinda Ndinda of Dja and Lobo, Hon. Paulinus Jua for Boyo and Hon. Paul Abine Ayah took turns in calling on government to set up a commission to probe the allegations. Hon. Jua expressed regret that funds were embezzled to the detriment of agriculture, which should be the backbone of the country's economy. "We are essentially an agricultural economy, we must do something to subsidise agriculture," Jua said. While equally condemning the MINADER embezzlement scandal, Hon. Aka Amuam, MP for Menchum, said it was paradoxical that Cameroon, which is essentially an agricultural economy, is pays little attention to agriculture. However, not every MP took ACDIC's investigative initiative in good taste. Apparently, taking great exception to the unveiling of the MINADER embezzlement scandal, one MP asked why ACDIC chose only 2004 when Kodock was the MINADER Minister to do a study on corruption. The MP insinuated that such a study was pregnant with political undertones, calculated to discredit Kodock.Reacting to this, Njonga stated that the study had nothing to do with politics. He said the fact that they chose 2004 to do their study when Kodock was Minister, was a mere coincidence. Even before ACDIC launched its reports, there had been press allegations that bespoke of Kodock's financial uncleanliness at the helm of MINADER. The Post learnt that some officials of MINADER recently wrote anonymous letters to the presidency complaining about the shady deals. It was because of this that Kodock organised a press conference at the Yaounde Jouvance Hotel recently. The Minister of State who is also the Secretary General of the Union des population du Cameroun, UPC party, used the occasion to lambast all those who alleged that he embezzled state funds. In a tacit reference to officials in MINADER, Kodock regretted that some people were holding nocturnal meetings to devise strategies to bring him down. Kodock presented himself as a great national patriot whom detractors were fighting to destroy. He said he is a peace-loving and harmless Cameroonian who is struggling to build the nation in his own way, and would not care to attack his enemies. During the occasion, copies of the UPC newsletter that carried virulent attacks on the present Minister of Agriculture and Rural Development, Clobert Tchatat, were widely distributed to militants. Talking about his tenure in MINADER, Kodock said he changed many negative things and brought about positive initiatives. He said as MINADER Minister, he was the only one who judiciously consumed credit in the execution of projects to the tune of 40 percent. Kodock said it was ridiculous that a senior official wrote an anonymous letter to the Presidency of the Republic claiming that he (Kodock) had not been paying his taxes since he became Minister in 2002. 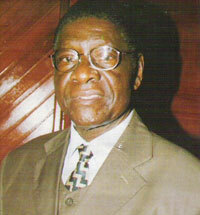 He said some of the people even called on President Paul Biya to sack him because he is too old. "If you live long, it means that you have God's blessing, so I have God's blessings," he said. Koddock, you are shamless. Even in the face of open fraud u still have something to say. No wonder u broke the UPC and betrayed oppositin parties to joined the GOMBO club. Give back what doesnot belong to you before ot takes you away. "If u live long it means u have God's BLESSING" . hEar who is talking. The judgment day shall tell who had God's blessing and who didn't. so why should he not beat his chest! This is a man who is said to have been the first Africans to have a Doctorate in Economnics in France,but he keeps confirming the fact that those who have flirted with France in any capacity are just like leprosy to the Cameroonian people. Presidentielle".He has always said it to the displeasure of his critics that he is one of those who kept the Republic intact ,by betraying the Opposition to Biya. He knew very well that Biya was a weak -minded leader,so by joining forces with him ,he was grooming himself to inflict his own pains on the country.This is somebody who always wants to pass for a Patroit,but will unprecedentedly put in place more than thirty swindling strategies. Mr Biya is now suffering from the waywardness that old age brings withal,and he equally knows that in Cameroon if you want to pull wool over people`s eyes and survive any political storm,talk strong and instantly you will pass for a political star. Koddock is a member of the "Socialist" UPC just like his mentor Mitterand was a member of the Parti Socialiste in France. Corrupt. They neither believe nor practice what they preach. It would be a serious dissappointment if any one of these French Africans lives up to their word, a grave dissappointment. Those naive fellows who believe that the French Africans are changing are up for an eye openner. Where they asleep all these years?